The trade deadline has come to pass and we now enter the most exciting portion of the season — the stretch run. The Tampa Bay Lightning sit in a precarious position in the Eastern Conference standings. As of this writing, the Bolts are four points behind the New York Islanders for the final Wild Card spot. Not the steepest of mountains to climb, but judging by the moves General Manager Steve Yzerman made at the deadline, along with the uncertainty encompassing the health of Steven Stamkos, some ascertained that the team was giving up on 2016-17. 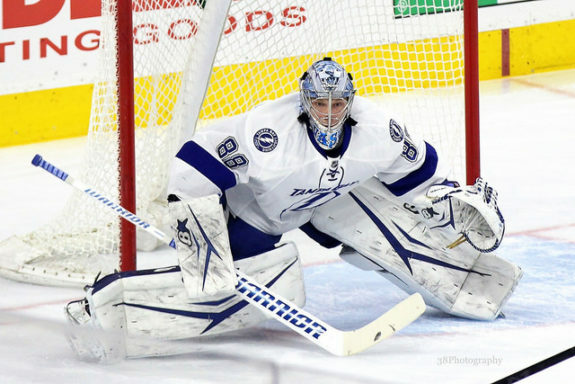 The Lightning were sellers at the deadline, trading number one goaltender Ben Bishop to the Los Angeles Kings, as well as shipping Valtteri Fillpula and Brian Boyle to the Philadelphia Flyers and Toronto Maple Leafs, respectively. Bishop’s experience and the face-off forte will be missed (Lightning are 20th in face off percentage) but those were necessary moves to give Yzerman some cap room flexibility this summer. So, where does that leave this current group of Lightning skaters? Despite the subtractions at the deadline and Stamkos’ torn lateral meniscus, they are in a position to make the Stanley Cup Playoffs. But that won’t be possible without a few guys stepping up in the wake of it all. Steven Stamkos has been out of the lineup since Nov. 15 with a right knee injury and the team has struggled offensively without him. In the 16 games before the injury, the Lightning were sixth in goals scored and had a 2.87 goals-for per games played (GF/GP). Since Stamkos has been absent from the lineup, they are 21st in goals and have a 2.54 GF/GP. 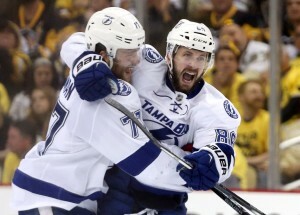 These offensive woes have attributed to the Lightning being on the outside of a playoff seed. Jon Cooper’s club was fifth in points before the Stamkos injury — 24th since. Stamkos has been skating this week, but his return is still uncertain. Going virtually a whole season without one of the best pure scorers in the league would spell disaster for a team and, at times, it has been for the Lightning. But since the All-Star break the Bolts have been much better and you can attribute a big chunk of the recent success to Nikita Kucherov. The 23-year-old right winger has been one of the best players in the NHL since the All-Star break. Since Jan. 30, Kucherov is tied for fifth in the NHL with 22 points and has two four-point outings in that time. The Lightning have reaped the benefits of Kucherov’s recent hot streak. The team is 9-4-3 since the break and are playing much better overall. Kucherov has been the only bright spot, offensively, for the Lightning. The 2016-17 Atlantic Conference All-Star has 30 goals and is in the top 10 in points with 66, but this recent stretch is even more magnified because of their position in the Eastern Conference standings. With Stamkos’ return being uncertain, Kucherov’s increased point production is immensely important. Rarely does a team on the cusp of a playoff berth deal away their number one goalie. But GM Yzerman was looking at the future and keeping some of his younger assets in tact by freeing up almost $5 million in cap space. What Yzerman was also saying by trading away Bishop is that he and the rest of the Lightning management have trust in backup Andrei Vasilevskiy. Overall, this season has been quite good for the Russian netminder. He has career highs in games played, wins and quality starts. He has some playoff experience (remember his relief appearances in the 2015 Stanley Cup Finals?) and as of late he has been playing exceptionally, especially since he was given the number one job. Since the Bishop trade (Feb. 27) Vasilevskiy is 4-0-1 with a .956 save percentage and given up six goals in four games, including the 1-0 overtime lose to the New York Rangers Monday night, where the Lightning played their best game all year. Vasilevskiy’s play down the stretch will be critical in the Bolts reaching the playoffs. The quality of play in net as well as Kucherov’s sizzling offense have given the Lightning hope. With 17 games left, the Bolts have a great opportunity to nab a wild card spot and possibly the third spot in the Atlantic Conference. With the two aforementioned playing at a high level, as well as contributions from secondary and tertiary players, Jon Cooper’s club may pull off a playoff berth, without their best player. But, if Stamkos does return in time for the playoffs, watch out Eastern Conference.